A unique tourist attraction that is world-famous and can only be found here, are the prehistoric Komodo dragons that live on the islands Komodo and Rinca. From Labuan Bajo you can reach the islands Komodo and Rinca by boat Both islands belong to the Komodo national park. About 1200 of the around 3000 Komodo dragons live on the smaller "Dragon" - Island Rinca. Because of that, Rinca Island is densely populated with Komodo dragons and it is most likely to experience these prehistoric animals in the wild. As Rinca Island is more scenic and located closer to Labuan Bajo, we recommend Rinca Island for a visit to the Komodo dragons. There is only one road from Eastern Flores to Western Flores and we lovingly call it "Flores-Highway". From Maumere to Labuan Bajo the way is "only" 550 km, but as the landscape is very mountainous and the "Flores Highway" is not always in good condition, you need 20 hours driving time for this route. In order to have enough time to visit all the attractions without hurry, we recommend you to allow 4 days with 3 overnight stays (in Moni, Bajawa and Ruteng) for the trip from Maumere to Labuan Bajo. If you should start your trip from Maumere to Labuan Bajo early in the morning ( 5 - 6 o'clock a.m.), 3 days and 2 overnight stays (in Bajawa und Ruteng) could also be enough. It is possible, but absolutely not recommendable, to jet from Maumere to Labuan Bajo in 2 days. It is possible to integrate a side trip to Riung on the Northern coast of Flores and to the 17-Island-Nationalpark and/or trekking to Wae Rebo. For your tour from Maumere to Labuan Bajo, we can glady arrange an air-conditioned car and a driver for you. Should you prefer, we would be glad to organize your individual tour with an English or German- speaking guide and all the overnight stays during your tour. The two unique tourist attraction that are world-famous and can only be found here, are the prehistoric Komodo dragons on the Islands Komodo and Rinca and the 3-coloured lakes of the volcano Kelimutu on Flores Island. There is only one road from east to west Flores and we lovingly call it "Flores-Highway". From Maumere to Labuan Bajo the way is "only" 550 km, but as the landscape is very mountainous and the streets are not always in good condition, you need 20 hours driving time for this route. In order to have enough time to visit all the attractions without hurry, we recommend to allow at least 4 days for the trip from Maumere to Labuan Bajo or vice versa. It is possible to include detours with hiking and snorkeling aktivities. On our website you can find an extract of our tour offers with pictures and further descriptions. All tours are private and can be tailored to your interests and wishes. A unique attraction, which is world-renowned and found nowhere else are the prehistoric Komodo lizards living on the Islands Komodo and Rinca in West of Flores Island. As Rinca Island is more scenic and located closer to Labuan Bajo, we recommend day boat excursion to Rinca Island to see the Komodo dragons. If you do a 2 Days/1 Night boat tour you can visit both Komodo Islands and have planty time for discover the famose underwater world of Komodo Nationalpark, see Pink Beach and climb on Padar Island for spectacular views. With a flight from Labuan Bajo to Ende it is possible to combine the visit of both main Flores attractions the 3-colored Lakes of the volcano Kelimutu and the visit to the prehistoric Komodo Dragons. 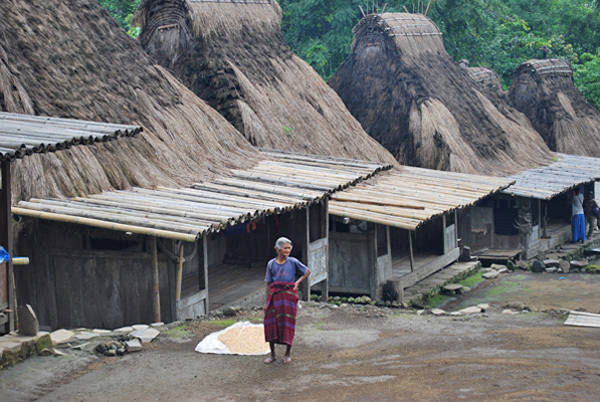 An Flores overland tour by car due to the modest tourist infrastructure and mostly very simple accommodation deters many from a visit to Flores Island. With our Deluxe Tour we offer a Tour with luxury accommodation in Boutique Villas. ◊ exploring the traditions of Ikat weaving and dances in Sikka Regancy & Caci ritual whip fight dance in Manggarai.